Container Summit will be taking place on May 3, 2016 at Mandalay Bay Convention Center. The event joins Interop 2016 to continue the conversation surrounding containers in the enterprise. Local Tianon Gravi, the SVP of Operations at InfoSiftr, will be speaking at the Summit. 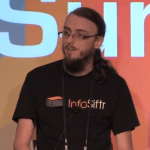 At InfoSiftr, he helps organizations “get Dockerized” and feel comfortable with their transition. Some of his other roles include being Docker Core Maintainer, serving as a member of the Technical Developer Community for the Open Container Initiative’s Runtime Specification, and is an official member of the Debian Project as an uploading Debian Developer. Container Summit will be coming to Las Vegas for the first time, and the team at InfoSiftr says they were players in that exciting decision. Past events have been in New York City and San Francisco. Other speakers include Las Vegas locals including EVP Cloud at Switch Supernap Jason Mendenhall, as well as team members from companies like Disney, Joyent, and Cisco. See the full speaker line-up here. Can’t make it to the event this year? Gravi says you might be able to catch it online. Or, at the very least, you can take a look at the material he plans to present. “I know past Container Summit events have been recorded (although the inaugural event wasn’t), so I’d imagine Joyent’s planning to coordinate with the folks at Interop to make that happen here too. I don’t have any specifics on that,” he said. In his career, Gravi says he has delivered one talk and sat on three panels. For those in the startup world with a technical background and an interest in speaking for the first time, he offers some advice. For Gravi, the biggest challenge when speaking solo is making sure he sounds natural and not trying to force conversation from the audience. There are more and more events talking about containers, but what sets Container Summit apart is a focus on sharing actual best practices from enterprise users of containers in production. Some of the most innovative enterprises like Walmart, Twitter, and Netflix have been running containers in production for years and have experience with what solution stacks work best, what pitfalls to avoid, and how to get optimal performance without breaking the bank. Attend this event! Get all the details here. Meet other members of the #VegasTech community who are doing amazing things in our “Meet #VegasTech Community Members” series!